White Alien is a F1 hybrid cross of the Cannabis Cup Sativa Champion 2005 Martian Mean Green and the classic original White Widow. Great yields and frosty resin covered buds are easy to get from White Alien and beginners love this strain! The expert grower can really push her and maximize the yields as White Alien can handle heavy nutrients and will be forgiving to minor mistakes. This is your test strain the strain you can pay with to fine tune your skills. Expect shorter flowering plants that frost out early in flower. Large dense buds provide heavy yields and the leaf to bud ratio is so low that trimming time is shortened significantly. 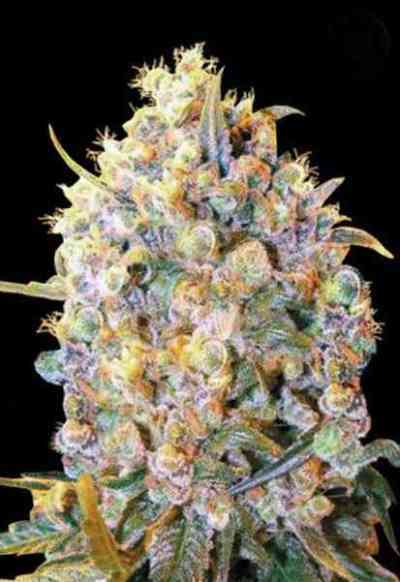 White Alien is a sativa dominate hybrid that can be used at night or in the evening and not keep you awake. The strength is intense for a sativa dominate hybrid and often just gets labeled a indica… The genetics are what they are 60% sativa and 40% indica but the effects are more like 70% indica and 30% sativa… FYI.